The new man who holds the title dean of programs is making a name for himself. He’s often seen overlooking the hallways, lunchroom, and various other parts of the school. The Stampede caught up with him sitting in his office to take time out of his busy day in order to get to know more about the man in the mirror, Brian Brower. Mr. Brower comes to us from upstate New York, Albany to be exact. Growing up around dairy farms and attending a small, Catholic boys military school, Mr. Brower had big dreams that would lead him elsewhere. He attended the University of Richmond where he studied history, and later received his master’s degree from Notre Dame in Catholic education. 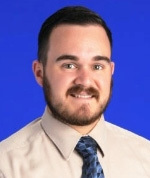 Before embarking on his journey here at McNamara, Mr. Brower was a social studies teacher at Don Bosco Cristo Rey High School in Takoma Park, Maryland. Although Mr. Brower enjoyed teaching, he had his eyes set on another goal: administration. Mr. Brower had vocalized his ambitions before, so it came as no surprise when a fellow colleague of his sent him the information about the position here, and he jumped at the opportunity. Mr.Brower had always admired the McNamara community and fell in love even more when he had the opportunity to come and really get to know the school on a more personal level. “The interactions with the students and teachers were warm and welcoming,” Mr. Brower said. Students and teachers alike can both agree that he has been a great edition to the BMHS family. Mr. Brower also appreciates the fact that there is a wide range of diversity in the Mustang community. Mr. Brower is currently very happy with his job and credits one of his proudest moments as an educator as never being more excited to start the school year than he was coming into McNamara this past summer.